I went to the Barking Crab in Boston last weekend expecting a tasty lobster meal. What I didn’t expect was seeing a giant 10lb edible sea monster from the deep sitting on the table in front of me. This lobster was massive – as large as a toddler and with pinchers that look like they could cut off a finger or 3! Luckily the claws were tied shut so it was safe for the staff to parade this guy around. Incredibly enough, on the day we went there was also an 8lb lobster making the rounds (you can see him in the picture below looking as large as the little kids petting him). When we asked how much these guys would cost, the owner said that since a 1.25lb lobster usually runs 25 dollars and this guy is 10 pounds, it would probably cost about 200 dollars! Wow – that’s one way to eat an entire month of groceries in one sitting. It should be noted that this restaurant is somewhat known for it’s large food though, as it was featured on the show Man v. Food on the Travel Channel. I would definitely give a thumbs up to the lobster (which tastes amazing with purified butter) and the clam chowder (full of bacon-y goodness). For the more adventurous, the steamers (baked clams) are a Boston favorite and they taste great, if a little fishy. Just be sure to ask someone how to clean the steamers before eating or you will get a mouth full of grit. 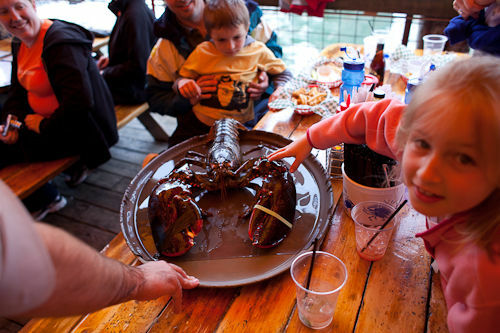 Overall, the Barking Crab is very solid restaurant with beautiful harbor views and a great outdoor patio. The food is priced reasonably, but this isn’t a cheap meal especially if you are going to have lobster. One of the best deals if you want to eat lobster is to split a clam bake, which includes a lobster, steamers, clam chowder, and cole slaw for about 40-50 dollars. The restaurant has cheaper fried seafood options and burgers as well, so your non crustacean loving or broke friends can come along too. Also, make sure to try some of the local beers from Harpoon and Samuel Adams to wash down the seafood goodness. Happy Travels and Happy Fooding!